It's important to note, in the age of repackaging and re-releasing, that a review of a classic game made modern by fancy HD graphics, is more about that revision then the game itself. Some games given that “new car” treatment become even more of a must have through the addition of extras not present during its initial run. Others become mere shells of their former selves, offering nothing new except for a shiny coat of paint, and in the case of much older games, a hint of sparkle from their new pearlescent dentures. Sadly, Heroes of Might and Magic 3 – HD Edition, belongs to the latter, and it has little to do with the game itself. Easily my favorite of the Might and Magic series, HoMM3 is a gem of a strategy game. For those unfamiliar with it, you take control of, depending on the map, any number of heroes, who each can control an army of underlings varying in both power and looks. Each hero belongs to a city type, determining both the type of hero and it's army of minions. The armies range from your standard elves, dwarves and knights, all the way through to paragons of the underworld like demons and the undead. The heroes move across an overworld and underworld, collecting gold, gaining experience, and acquiring artifacts. While the beginning of each game feels a bit slow, especially when you are building up your cities and gathering your army, the end is a fantastic whirlwind of blood and magic as hundreds, or quite possibly thousands of underlings go to war on a hex grid map. Sure they're stacked on top of one another, so the only thing that lets you know there is more then one Archangel in that hex is a number printed next to them, but that number gets so BIG. Holding the same powerful sway as the Civilization games, Heroes is a game that screams for “just one more turn.” It's this reason that I feel almost scandalous in my stern condemnation of this HD version. The word value is often thrown about in regards to games, normally in the context of the dread “dollars vs. time debate.” It especially rare though, when, as a reviewer, I can point to a simple money comparison regarding a game's value to show why this is simply not worth the time. Coming in at $15, the value is simply not there. Available for less is this same game, only more of it. While this version boasts a beautiful HD sheen, it's incomplete, as it comes with it none of the expansion packs that were released so many years ago. This is a HUGE problem, because those expansion packs added not only new campaigns, an additional city type, and new items, but a random map generator that extended the game through to damn near forever. That absence, and it's near instant availability for less money in the non-HD version, which could, mind you, easily be made HD through a mod, is appalling. It's a huge oversight, something I'm sure is due to some kind of real world catastrophe. I mean, it has to be, right? Ignoring the fact that this version is published by Ubisoft, and all the jokes that go with it, what possible reason could have kept that content from getting into this version? On top of the mysteriously missing content, the game also joins Ubisoft's recent spate of releases that feel broken right out of the proverbial box. Multiple times I was forced to replay swaths of time as my saves became corrupted, causing the game to shut down anytime I tried to load them. The multiplayer, with a Steam lobby touted by the “New Features” list, is sluggish when it works, and crashes the game when it doesn't. Short of the slightly improved visuals, there is no part of this game that feels at all equal to or surpassing the original. Frankly, this is the kind of nostalgia ridden, cash grab that makes me almost want to cry. The kind where you really want to believe that their hearts were in the right place, but they lost themselves somewhere between cash and being honest with themselves. 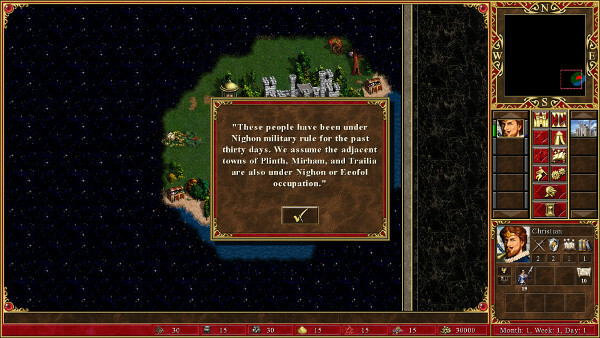 Heroes of Might and Magic 3 is a great game. If you haven't played it, you can pick it up, and it's expansions, and it's random map generator, up from reputable sources for about $5 less then you would spend for this HD version. You could probably even get it for less during one of the umpteen sales held by those same reputable dealers of fine video games at various points throughout the year. Whatever you decide, I can not, in good conscience or otherwise, recommend this version. It is, in no uncertain terms, a waste of money. As with any recent Ubisoft product, you can spend the Uplay points you’ve obtained on a selection of various digital items such as branded wallpapers and in-game perks. Oh, Uplay! Company of Heroes 2 brings the absolutely brutal nature of this conflict to light with a campaign that shows just how little regard both sides had for human life.